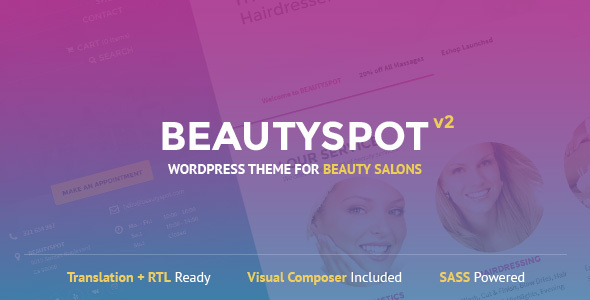 Perfect WordPress Theme for Your Beauty Salon, Hairdressers, Wellness or Spa! HTML version is also available. 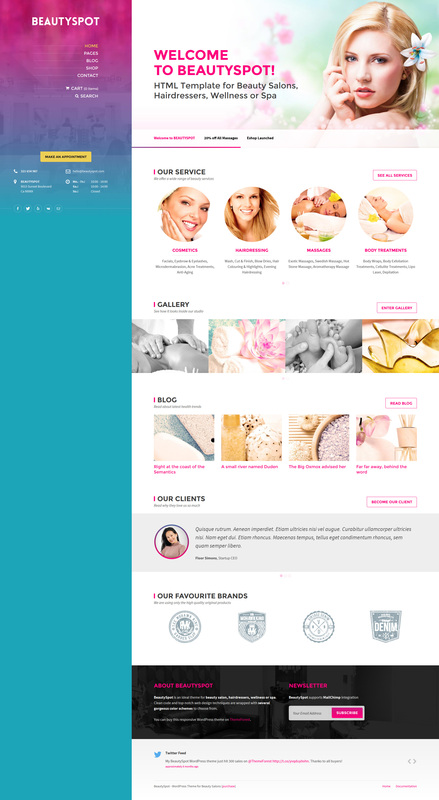 Coded with SASS so you can create a custom color skin for your beauty salon in few minutes! Images seen in preview are NOT included. Check out the documentation to learn where you can obtain your own licences for those images. Complete changelog can be found here. Fixed bug with services images for Aqua Page Builder users. Updated Redux Framework to version 3.3.9.34. Updated Redux Framework to version 3.3.9.20. Fixed issue with left aligned images. Updated Redux Framework to version 3.3.9.10. Removed some old code from breadcrumbs.php. Updated Redux Framework to version 3.3.9.6. Fixed media upload issue in Theme Options. Updated Redux Framework to version 3.3.9.1. Better optimization of header contact info on mobile devices. Fixed issue with some form elements. Fixed some issues with Social Icons. Please review your social icons after applying this update under Theme Options / General Settings and resave them. Updated Redux Framework to version 3.3.8.8. Hotfix for issue with Reservation Form. Better optimization for Reservation form on mobile devices. Fixed bug with incorrect font family for some titles. Updated Redux Framework to version 3.3.8.6. Fixed font rendering in Chrome for various elements. Fixed resetting of the Contact/Reservation form after submit. Updated Redux Framework to version 3.3.7.10. Hotfix for issue with Social Icons. Updated FontAwesome icons to version 4.2. Fixed styling for Woocommerce Price Filter widget. Fixed issue with Shortcode Generator modal for upcoming WP 4.0. Fixed bug with Previous / Next post links in post detail. Updated Redux Framework to version 3.3.6.6. Updated Redux Framework to version 3.3.5.12. Hotfix for issue with Tab & Accordion block in Page Builder. Hotfix for issue with color schemes. Added a custom version of Aqua Page Builder called Aqua Page Builder (LSVR). Please remove the standard APB plugin before installing this version. Added RSS, Mail and VK social icons. Added option to make Accordion item opened by default when using Page Builder. Updated Child Theme to version 1.0.1 (added library/img folder from the parent theme). Updated documentation (how to change slider height). Small hotfix which adds a notification about the latest version of LSVR Toolkit (BeautySpot) to wp-admin. Added option to disable the "Home" link in breadcrumbs and change its label (Theme Options / Pages). Added option to Button shortcode to open the link in a new tab. Added support for HTML formatting for gallery item titles (Only through the Gallery block of page  Builder). Added support for third level menu in the Header menu. Fixed the breadcrumbs for pages with hierarchy. Fixed the Sidebar/Header flickering on scroll in Chrome. Minor Header CSS optimization for iPad. Added option to open social icons in new tab (in Theme Options / General Settings). Added image preview to Gallery block in the Page Builder. Added option to crop thumbnails in Gallery block of the Page Builder. Better theme optimization by merging various JS files. Updated Redux Framework to version 3.3.3.3. Updated documentation with tutorial on how to create the Gallery page. Fixed radio inputs functionality in reservation form. Datepicker in the Reservation Form is now translatable. New Video shortcode / page builder block.